GRP Grating Systems Mini Mesh grating is supplied to the marina sector in the UK & EU. Our fibreglass marina decking and pontoon decking is used by marinas/harbour masters as a replacement for worn timber pontoon decking or steel grating. The grating is easily integrated into new/old pontoon systems, pontoon fingers, bridges, walkways and new marina developments. Mini mesh pontoon decking contains a gritted, anti-slip surface and has been tested to BS standards with an excellent slip-resistance in wet, oily and icy conditions. The gritted anti-slip surface of Mini mesh pontoon deck provides long-lasting protection against heavy damage and is the perfect replacement for traditional deck materials such as timber when used in marina developments. GRP Grating Systems Mini Mesh Grating has a 12mm x 12mm mesh size and the Micro – Mesh grating has a 8mm x 8mm mesh size. The small opening prevents objects as small as 13mm from falling through and complies with the European 15 mm ball falling test requirement. The smaller holes also offer smooth movement for small wheeled trolleys, wheelchairs, prams, delivery trolleys etc. The mesh size still allows plenty of sunlight to reach marine plants and life keeping a sound ecological marine system. As well as fulfilling requirements for design aesthetics, mini mesh grating pontoon decking brings new levels of safety to the industry. 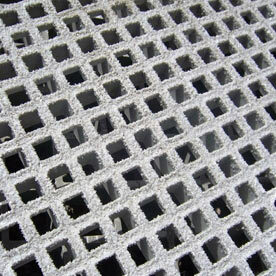 Fibreglass grating offers optimum levels of safety, even in freezing conditions and when subjected to oil and high seas. It is also algae resistant and maintenance free, making it not only one of the safest, but also the most cost effective surfaces on the market today.